The XVIth international chess tournament "Citta' di Padova" ended last Sunday with the victory of GM Kiril Georgiev, who got 7 points out of 9 games. The tournament saw the participation of 63 players from 13 countries, with a total of 11 grandmasters and 13 international masters, plus nine other Fide titled players. I participated in the event and scored a good 4.5/9, winning four games and losing four. Below I am showing some salient points from a few of my games. black played 12....Nh5? which allowed 13.Nb5! Qxd2 14.Bxd2 Nf4 15.Bc4! a6 16.Nxd6 b5 17.Bb3 f5? 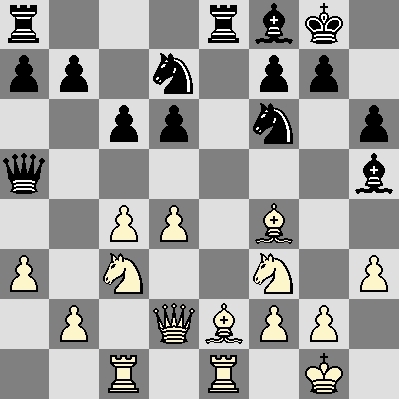 In the above position white has several ways to get a winning position. I analyzed many variations but incorrectly chose the most "tactical" way, which was less effective - but was enough to win. I played 18.Bb4 Rd8 19.Nxc8 Nxc8 20.d6+ Kf8 21.Ng5 Nxd6 22.Nf7 with a winning advantage; on the other hand 18.Bxf4! 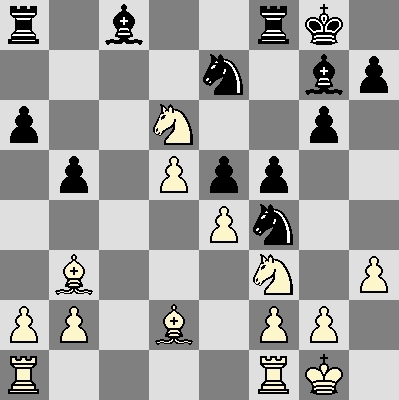 exf4 19.e5 would have been much simpler. 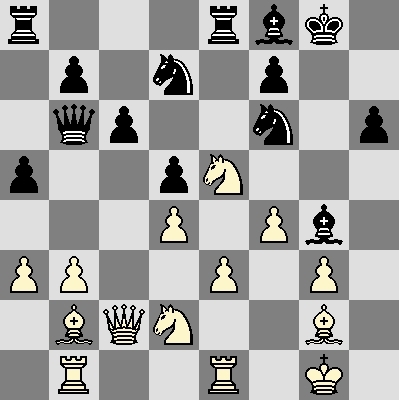 On the fourth round I played against Claus Seyfried, a elo-2180 player, with the black pieces. In the position below white appears to be able to gain space on the queenside, but I had correctly evaluated that I could then effectively sacrifice the exchange for two pawns and a safe position. He played 16.b4?! Qxa3! when he sank in deep though. Of course if now 17.Ra1 Qb4 18.Reb1 Rxe2! black stands no worse. 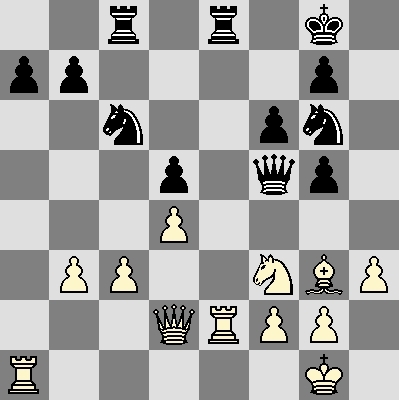 White thus played 17.Rb1, but unfortunately I badly misplayed the resulting middlegame and ended up losing. Here I should have played calmly 22....Bg7, but I decided to play for a kingside attack: 22....Nxe5 23.fxe5 Nh7 24.Kh2 Qd8 25.e4 Qd7, intending Ng5 and Bh3. Unfortunately my plan never concretized, and I soon lost a pawn. 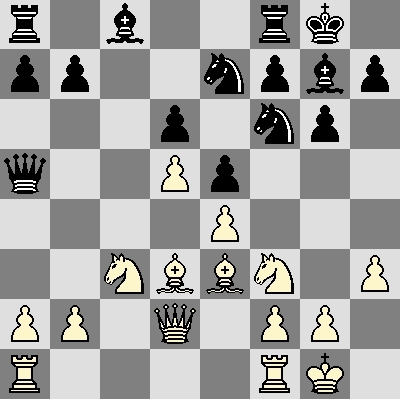 On round 7 I won against a 1800 player who tried to attack my position when his position did not allow him to do so: in the position below I am black, and it is white's turn. 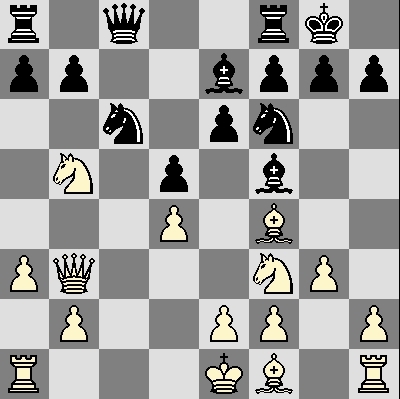 Do you see the problem with white's choice 11.Nc7? Of course black played 11....g5! (11....Be4! would also do). After 12.Be5? Nxe5 13.fxe5 Qxc7 14.exf6 Bxf6 black's position is simply won, and indeed in six more moves I trapped his queen and he resigned. Finally, after a uneventful draw on round 8 with a 2100 player, I won convincingly the last round despite a momentary lapse of reason. In the following position I have black and it's my turn to move. Do you see the simple way to get an advantage ? After 29....Rxe5! 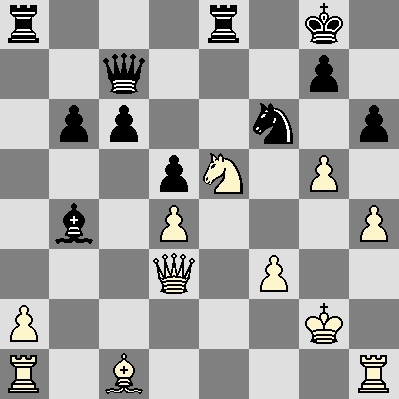 30.Bf4 (there is nothing better) Rxg5+ 31.hxg5 Qxf4 32.gxf6 Ra3! it is basically game over. My opponent chose 30.exf6 but after 31.Re6 fxg7 the position is a win for black. All in all, I am not too dissatisfied with my play, although I did waste at least a half point (with Seyfried on Round 4). My performance rating was 2097, which is in the ballpark of my playing strength.